The decree notes that this decision was made "in response to Ukraine’s unfriendly actions"
MOSCOW, October 22. /TASS/. Russian President Vladimir Putin has signed a decree on special economic measures in response to Kiev’s anti-Russian sanctions. The document has been published on the official website of the Kremlin. The directive notes that this decision was made "in response to Ukraine’s unfriendly actions, which are run counter to international law and imply the introduction of restrictive measures against citizens and legal entities of the Russian Federation", in addition to “protecting national interests." 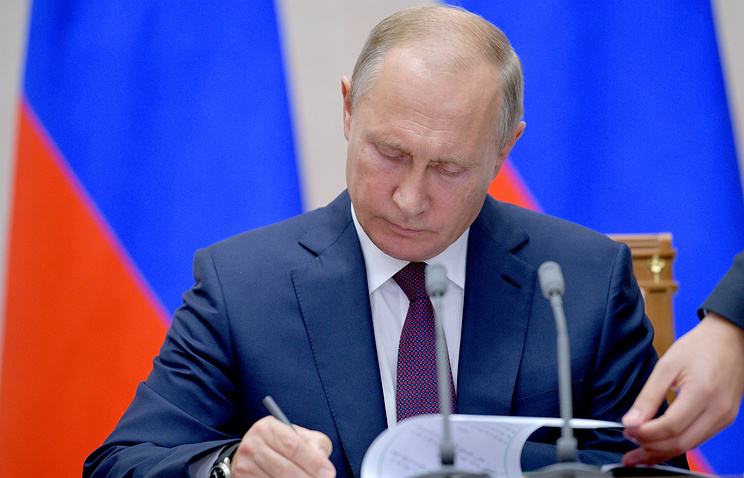 The Russian government has been instructed to draw up lists of individuals and legal entities that the special economic measures are targeted at, as well as to determine "special economic measures applicable to individuals and legal entities." Under the decree, federal agencies, regional and local authorities should be guided by the fact that from the day the decree comes into force, special economic measures are applied to the sanctioned individuals and entities. It is noted that the document enters into force on the date of its signing. The decree can be cancelled by a decision of the Russian Federation, should Ukraine abolish its restrictive measures imposed on citizens and legal entities of Russia.